How Do Zener Cards Work To Improve Your Extrasensory Perception? In physics, the first law of thermodynamics is thus: energy cannot be created nor destroyed. Many would argue that we humans are just concentrated energy, existing within a vessel and creating the experience that we call “life.” It is by the same token, then, that when we exert energy, it goes somewhere. It travels out to the universe and, in one form or fashion, gets picked up again. Zener cards (also known as Rhine-Zener cards) were developed in the 1930s, and are one of the many ways you can tap into your more visceral self, particularly in the ways of telepathy. In society today, the concept of telepathy is sensationalized and adapted to a work of fiction for the most part. However, if we know the concept of energy to be true, who is to say that with the energy of brain waves and interpersonal connection, telepathy is not more attainable than we think? 1 What Are Zener Cards? 5 So What Is This All for? 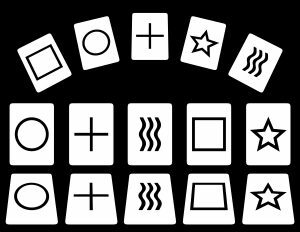 A standard Zener card deck is made up of twenty-five cards, and within those cards, five different patterns: There are five circles, five squares, five crosses, five stars, and five waves. They are unlike playing cards or Tarot cards in that their make-up is not defined by color, visual symbolism, or anything of the like—solely the shapes on each card and the fact that they all appear five times each. A Zener card deck can be easily found online to purchase, but will work just as well printed out from a PDF (again, unlike Tarot cards, as the purpose for using the two decks is vastly different). There are also many available books that analyze and dissect the process of a Zener card trial as well as the cards themselves. the monitor will keep track of “hits” and “misses” without notifying either until the trial is over. It is recommended, particularly for the monitor, to be in possession of a notebook of sorts to keep track of the results. Any other requirements or requests for the sender and receiver in regards to their environment for the process should be adhered to. Mental performance can only be optimized if the individual is willing to reach that state of ability, and therefore if anyone would prefer incense, a noise-maker, something to hold, or any other stable aspect of their environment that enhances focus better, the requested items should be bestowed upon the sender and/or receiver in order to perform at their peak. As was mentioned in the last section, concentration is imperative to this exchange. There must be no excess noise or events happening around or within you, but merely the sheer focus of sending these images from one to another via brain waves. The sender has their stack of Zener cards, shuffled, and placed face down in front of them. The sender picks up one card at a time and studies it, focusing. 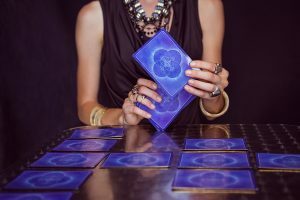 They contribute all of their energy and focus into sending the image of each card to the receiver, perhaps imagining that image’s journey as going straight through the receiver’s forehead. The receiver will close their eyes and match the sender’s level of focus. It is highly encouraged that the monitor makes no remark as to if the cards were a match or not throughout the entire process. This is to ensure that concentration is at its peak, and neither the sender or receiver is reconstructing their focus and energy to skew the results throughout the trial as opposed to prioritizing the sending and receiving of images. Once the Zener card trial is over, review the “hits” and “misses” as documented by the monitor. How many cards did you go through, and out of those how many were hits? Misses? Was every card incorrect, but only because the receiver was receiving these images a full card behind the sender, thus making them completely correct if you take into account the delay? These are all things to go over together, assuming your monitor has taken good notes. By the end, discuss your results with each other. What do you think this means in regard to your power as individual telepaths or the strength within your relationship? If the two of you have had a strain on your dynamic and had a low match rate from the Zener card exercise, maybe now is a good chance to use the results of the trial to reflect. Or, conversely, perhaps it is a more individualized result, and just reflects your capabilities—or need for improvement—in concentration. Using Zener cards can be a great method for meditation, enhancing your concentration, and even getting together with friends. Because this exercise can be done regardless of physical space, you can try it over video chat with any long distance friends or relatives to feel a little bit closer. 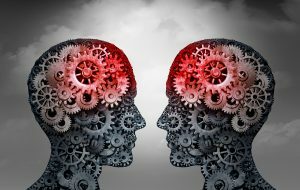 Additionally, once done repeatedly, it can give you an idea of what needs to be improved as far as your ability to focus and your connection with other people. And, like any exercise, concentration and its use in a Zener card trial can be improved upon if practiced thoroughly enough. Telepathy and other powers of the mind can be developed over time if the time and effort are put into their growth. If you are not a telepath already, you can be, so long as you put in the work and welcome the journey as much as you welcome the ability.